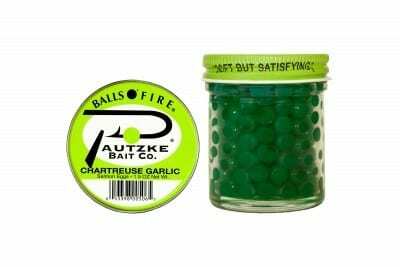 Known globally as the highest quality salmon egg on the planet, Pautzke’s Pink Shrimp Balls o’ Fire salmon eggs are not only particularly valuable for trout, but also a favorite for salmon and steelhead anglers. Cooked to precision and combined with our secret Pautzke family recipe, the Premium egg is plump, juicy and the largest egg in our line in addition to being UV enhanced. It’s the preferred egg for tying spawn sacks, when fishing for salmon or steelhead and trout. Plump, juicy and firm it’s the largest egg in our line and combines two things all steelhead and trout love: the color pink and the smell of shrimp. Hand picked from late harvest king salmon, Pink Shrimp is our utmost quality egg in the Balls O’ Fire line. These top of the line eggs are uniform in size, tightly graded, clean and large. There are no loose fragments of eggs in the jar. They are the highest quality egg available period. Pink Shrimp eggs are the perfect egg for the angler who is willing to spend more money for a better product. They are often fished solo on a single salmon egg hook or tied into spawn bags in the Great Lakes for steelhead. Pink Shrimp maintains a powerful shrimp scent with vibrant colors.